The Atlassian Crowd team is delighted to present Crowd 1.2.Crowd 1.2 is a major release that focuses on enhanced integration, security and usability. 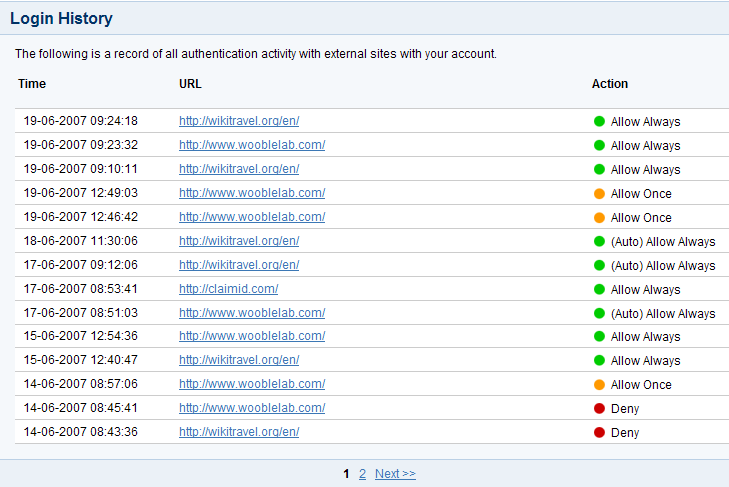 Crowd's directory permissions now allow finer-grained control, so that you can define the permissions per application. The Group and Role Browsers now display group/role membership. We have enhanced group management in the existing Jive Forums and Apache/Subversion connectors. Our NTLM plugin offers SSO (single sign-on) for JIRA and Confluence via NTLM desktop authentication. A new connector lets you integrate your Acegi security solution with Crowd. And you can import your Bamboo users directly into a Crowd directory. We'd like to say a special thank you to CustomWare for their assistance with deployment and testing of the NTLM plugin. Stop Press — 27 February 2008: We got a little bit ahead of ourselves with our announcement of full NTLM support in Crowd 1.2. The NTLM plugins for JIRA and for Confluence are provided and supported by a third party, not by Atlassian. You can download Crowd from the Atlassian website. If upgrading from a previous version, please read the Upgrade Notes. Directory permissions determine whether groups, principals and roles can be added, modified or deleted. Before this release, permissions were set at directory level only. Permissions therefore applied across all applications associated with the directory. With Crowd 1.2, directory permissions can be set for each application. 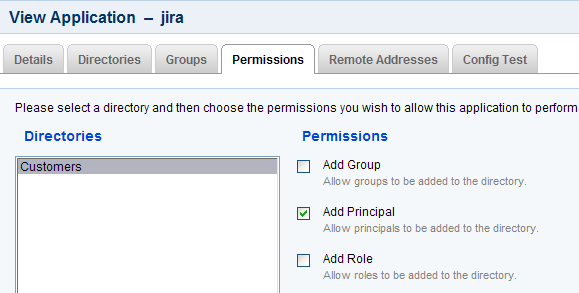 For example, you could enable the 'Add Principal' permission on the 'Employees' directory for JIRA but disable the permission for Confluence. See the screenshot below, and take a look at an example. A new 'Principals' tab in the Group Browser shows all principals belonging to a group. You can view membership in the Role Browser too. Instead of showing all login history on a single page, the Login History screen now divides the history into pages, for easier viewing. To move between pages, click 'Next', 'Prev' or a specific page number. In the 'Action' column, a new item '(Auto) Allow Always' tells you which logins were allowed automatically because of a previous 'Allow Always' instruction. NTLM is a Microsoft authentication protocol that allows you to access a website using your desktop login. The protocol utilizes an integration between Microsoft Internet Explorer and Active Directory. When using this feature, users will only need to log in to their desktop to access NTLM-integrated applications. JIRA and Confluence NTLM connectors are now supported with Crowd 1.2. Read the instructions on setting up Confluence and JIRA NTLM support in Crowd. Crowd 1.2 provides support for group management in Jive Forums. Groups and group memberships are now pulled from Crowd. You can use the Jive Forums admin console to define application permissions associated with groups. This allows Crowd to manage Jive Forums groups and memberships and Jive Forums to handle the permissions associated with the groups. Crowd 1.2 provides a built-in application connector for Acegi, a security solution with a particular emphasis on Spring Java/JEE applications. Crowd allows you to password-protect your SVN repository running under Apache. You can now also configure fine-grained access by group as well as by user. Read more about the Crowd Subversion connector. Our new Bamboo importer allows you to copy your Bamboo users into a Crowd directory.